Learn about the various components of the embeddable Ad Hoc Report Creator client and how to create your own Ad Hoc report. The header displays the current <report> name and the full screen button. 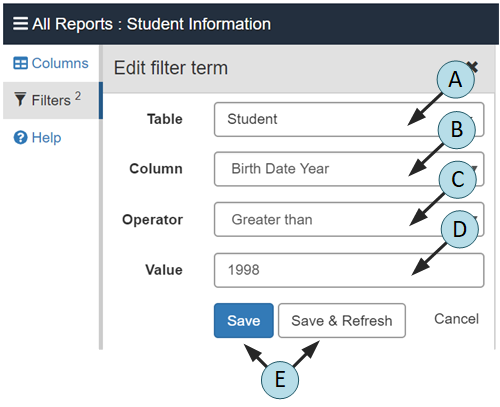 The Columns panel presents the <report>'s tree graph of related <table>s and the <column>s available within each table. 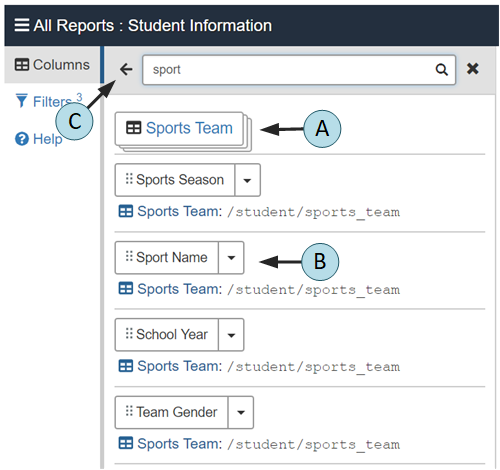 Additionally, the Columns panel has controls to add columns to the Export Report REST API result, filter columns, and view catalog configuration metadata. 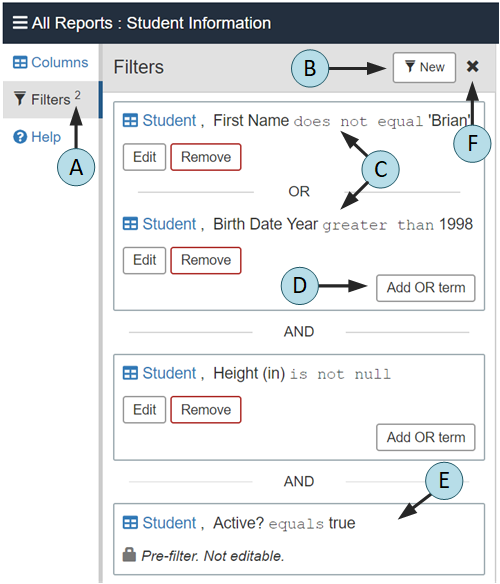 The Columns panel focuses one table within the tree graph at a time. 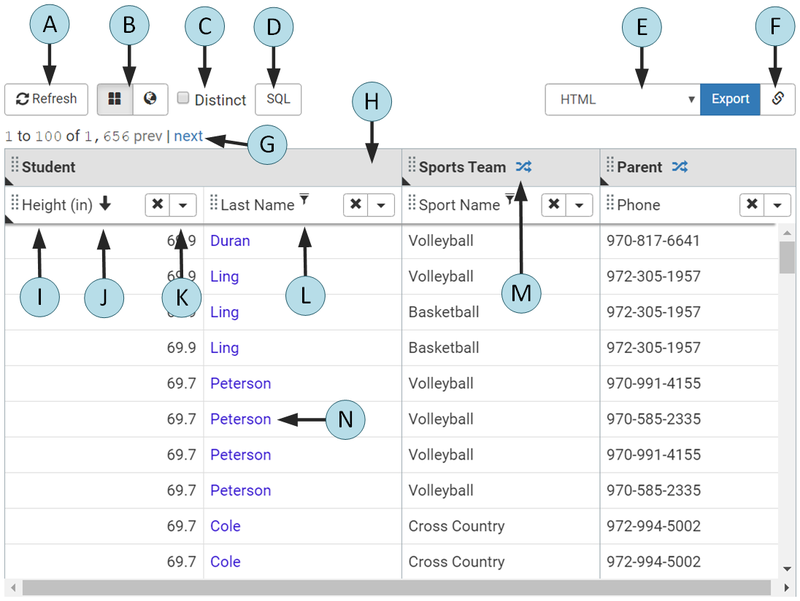 Navigate to a different table via the table tree graph popover or table path breadcrumbs. The Columns panel indicator highlights when the columns panel is active. The first two table navigation buttons support back and forward navigation through the history of tables visited in the Columns panel. The buttons are disabled if a particular navigation direction is not available. 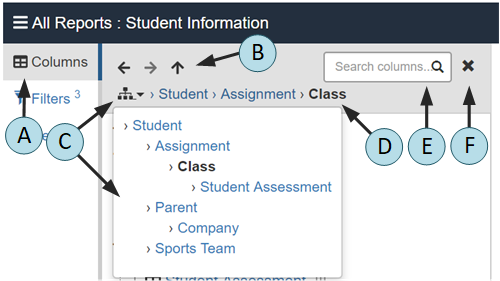 The third table navigation button supports navigating up to the parent table in the report table tree graph. The button is disabled if the report's base table has focus within the panel. Clicking the table tree graph button displays the report's table tree graph in a popover. Within the popover, the focused table is indicated in bold font. Clicking any other table focuses the Columns panel to that table. The table path breadcrumbs show the relational join path of the focused table. The focused table is listed at the end of the path in bold font. Clicking any other table within the breadcrumbs focuses the Columns panel to that table. Clicking the search columns input changes the Columns panel to search mode. Clicking the close button closes the panel. 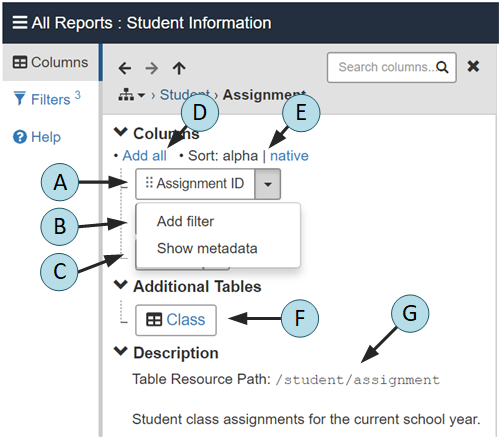 The Columns panel body lists the <column>s of the currently focused table and provides controls to add columns to the report export, create filters, and view metadata. Click or drag column labels into the Results Preview to add them to the export results. Clicking a label adds the column as the last column in the Results Preview. Dragging a column allows the column to be precisely positioned. The column labels are taken from the <column>'s displayName attribute. When the column is included the export results, a check icon is displayed to the right of the column name. Shift+click a column label to remove that column from the Results Preview. Any columns attributed as export='false' are listed separately under the Non-exportable Columns label. They may be filtered but not added to the export results. Select the Add filter menu item to open the Filters panel, Create Filter form with the column pre-selected. Select the Show Metadata menu item to view the <column> metadata such as the description, id, and paramType. Clicking the Metadata button again closes the metadata. Click the Add all button to add all exportable columns from the focused table to the end of the export results. The Column order toggle button toggles the column order between alphabetical (the default) and the native order in which the <column>s are listed within the <table> configuration. The additional tables section lists the child <relationship> tables of the focused <table>. Clicking a table name focuses the Columns panel to the table. Any additional table with a cardinality of many will appear stacked. The description section displays the table resource path and table description, if specified. The Columns panel search mode supports full text searching of <table> and <column> displayName attributes and <description>s. Tables and columns within the search results contain controls to add columns to the export result and create filters. Click a table search result to focus the table within the Columns panel. Column search results contain the same controls for adding the column to the export result, filtration, and metadata viewing as does the Columns panel, normal mode. Additionally, the column's parent table name and path display below the column control to provide additional context. The return button returns to Columns panel normal mode. The Filters panel supports creation and editing of filter parameters to be applied to the Export Report REST API export. Click the New button to create a new filter to be logically AND'ed together with other filters. Each filter term's column, operator, and value information display within the Filters panel with accompanying Edit and Remove buttons. Multiple filter terms within the same filter are logically OR'ed together. Multiple filters are logically AND'ed together. Click the hyperlinked table name within a filter term to focus the table within the Columns Panel. Click the Add OR term button to create a new term to be logically OR'ed to the existing terms in the filter. Any <pre_filter>s applied to the report display as non-editable filters with a lock icon instead of edit controls. Drop down list of the <table> elements available for filtration. Drop down list of the table's <column> elements available for filtration based on the selected table. Drop down list of the filter operators available based on the selected <column>'s paramType. User supplied value for the filter if applicable for the selected operator. For <column>s with a child <label_value_list> element, the user will be able to select one or more of the pre-defined values from a select list. Click the Save button to persist the filter term but not apply the filter criteria to the Results Preview. Use the Save button when creating multiple filters to prevent unnecessarily refreshing the Results Preview. Then use the Results Preview Refresh button to refresh the preview after completing all filter configuration. Click Save & Refresh to both persist the filter and refresh the Results Preview. The Results Preview displays a limited preview of the export results and contains controls to export the report to any export format. By default, the Results Preview displays the first 100 records within the exported report. Refreshes the export results from the database. The Refresh button turns dark blue to indicate that the current export results are stale due to the creation or editing of a filter or addition of a new column. Toggles the distict export parameter. See the distinct parameter example usage documentation in the REST API guide for more information. Displays the Structured Query Language (SQL) and query parameters to be used when creating the report export. The cross join indicator displays within a table cell header when the table contributes to a cross join in the report export. Cross joins happen when multiple tables in a to-many join relationship to the base table are included in the report export without a join condition. Clicking the indicator button opens a dialog which explains the cross join and possible courses of action. <column>s with a child <url_template> element have hyperlinked values. Reference documentation for how to configure the Report Creator embeddable client via HTTP query parameters in order to set the current report, filters, sort, and more. The Pull Reports™ Report Creator responds to HTTP parameters encoded within the browser's location. Use these parameters to construct a URL to load a specific <report> within the creator, set filters, and sort or include columns. will load the <report> of id myreport within <catalog> with id mycatalog and apply the filter @id > 100. Designates the <catalog> id to load. Designates the columns to be included within the Result Preview panel. The columns parameter value is formatted identically to the Export Report REST API columns parameter. Boolean value which sets the "Distinct" checkbox of the Result Preview panel. Designates the filters to be applied to the results within the Result Preview and Filter Summary panels. The filter parameter value is formatted identically to the Export Report REST API filter parameter. Designates the result offset of the Result Preview panel. Designates the <report> id to load. 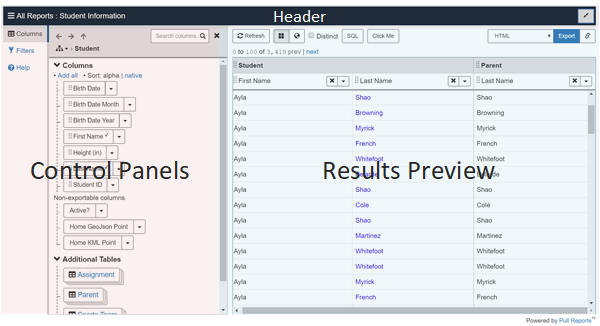 Designates the sort to be applied to the columns of the Result Preview panel. The sort parameter value is formatted identically to the Export Report REST API sort parameter.